The burqa is not an Islamic fashion per-se, but rather a tradition not opposed by Islamic teaching, which is probably the best way to present it. Covering the face, and in particular the mouth, has a geographical and environmental genealogy (such as the protection of skin and eyes from the dust and sand of, for instance, the Afghan desert). If such a garment is anything in Islam, it is a scholarly theological diatribe, with some sheikhs ready to wrap a baby in it, and others stating that it is not Islamic dress per-se. This discussion in western countries has many origins: from ideological traditions, as in the case of the French ban, where the state must impose laïcité; to Australia, where burqas seem to amuse children, create multicultural headaches, and facilitate intolerant bigotry. On the other side of the spectrum, any criticism of the supposedly spiritual garment provokes indignation, post-colonial theorizing, and often accusations of ‘Islamophobia‘. The debate about the burqa is well known, with all its contradictions, which I will not debate here, since I have done so in other parts of my blog (see The Atomic Burqa, Burqu’ing freedom, and Muslims as ‘cultural objects’). What I wish to discuss here is the contradictions of our liberal societies and also the fact that the topic is never discussed from an individual perspective and as an individual right. We can start from a simple observation: how many of those whom discuss the burqa have spoken to a woman wearing it? Probably very few, and I expect none of those sitting in parliament in the UK or Australia, let alone France. How many of those whom discuss the burqa have ever worn one? Probably even fewer. In conclusion, we can easily estimate that the majority of those involved in the discussion (and this includes the majority of Muslims involved in the discussion) have never worn it or in some cases never even spoken to a woman wearing it. Personally I had this opportunity, yet I have never worn one myself. For whomever may be curious, it is not difficult to find experiences in wearing a burqa, like for instance this quite amusing one. To be clear, even among my informants some reported that the burqa is uncomfortable, often hot, and may sometimes make even the most simple things, like eating, drinking and using a public toilet, somewhat tricky. Yet we ought notice that a burqa, as uncomfortable as it might be to some, has fewer health risks than other widely accepted female garments of torture. However, I will not discuss here the fact that in both cases the female decision to ‘torture herself’ can be interpreted though many accusatory feminist theories, which have all one single conclusion: the condemnation of 50% of humanity as genetic oppressors. Instead, I wish to look at the discussion from an individual perspective, which means asking in what way such garments make these women feel happier or better about themselves. Since here we discuss Muslim dress, I will limit myself to the experience of those women I spoke to. A selection of the reasons I’ve collected for wearing a burqa include: “it is part of my style”, “I would feel naked without it”, “I feel protected”, “Allah will reward my sacrifice”, “it gives me freedom while reassuring my relatives”, as well as “I feel I am not a sexual object”, just to mention some. In these cases, the women had an individual right to dress as they wished and for the reasons they wanted. As you can see, the reason may be very different from one person to another, but in general (other than in cases in which it may be forcibly imposed) the women wearing it felt their compromise was worth it. This leaves me with the question of when politicians, the general public and chronically grouchy people call for the ban of the burqa (or better burqu as it should be), what are they calling for? There is only one answer to it, beyond the many ideological ones that may follow afterwards. What they are calling for is the suppression of an individual right in an attempt to suppress an abstract symbol. In fact, while the different actors can project their preferred meaning to the symbol (such as “holy”, “pious”, “oppressive, “backwards”, “anti-western”, “Islamic”, etc. ), here the suppression of an individual right is a real measurable fact. The suppression of an individual right when such right does not infringe upon the rights of any other individual can be defined only in one way: illiberal. Our ‘liberal’ democratic parliaments should never engage in the direct suppression of individual freedoms, in particular when such freedom has no consequences for others, as much research has shown in the case of the burqa. Now there is another aspect of this story: the continuous demonization of those whom, even harshly, criticize the garment. Increasingly, these critics are demonized by Muslim community representatives, academics as well as by some advocates for minorities as Islamophobic, Muslim haters and a long list of other accusatory epithets. Again, the attempt to understand the tension between the different positions does not take into consideration the ‘individual’ but instead creates Manichaean battle camps, in which a real clash of civilizers takes place. 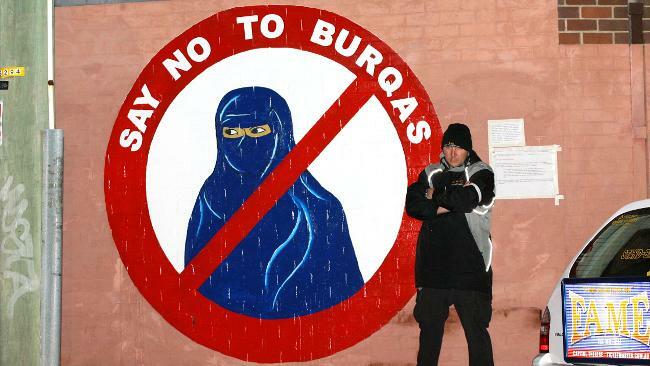 Although the material of another post, much the problem about the burqa debate (as other similar debates involving Muslim traditions) derives from the idea–and it is an idea–that today we live in a multicultural society, or for others, such as David Cameron or Angela Merkel, a failed multicultural society. In reality, what we have is an empty contemporary discourse of difference in which both camps, the pro-burqa and the anti-burqa (to maintain the Manichean jargon) show the same negative meta-discourse: an extreme illiberal approach to individual agency. → Ideology of mixing? Should tolerance be acceptance? You are kidding correct? Forget all the various attempts to discredit the wearing or not wearing of a burqu. The fact is that in western culture the only people who cover their faces in public are traditionally burglars who want to hide their identity or people who are involved in some sort of work which requires them to wear protective clothing. What is really under debate here is the question of what respect does one show to the country one is in? If a church requires a woman to cover her arms and head in order to enter it the woman has a choice. Cover herself, or don’t enter. If it is required in certain Muslim countries for a woman to cover her arms and head- again a woman has a choice not to go to the country. If a woman feels strongly about not wishing to show her face in public in countries where it is expected to show your face either don’t go to that country or don’t go out in public. I for one feel uncomfortable in the company of anyone with a covered face in public, unless it is a fancy dress party. In the eyes of Western society the position of muslim women is often portrayed as full of plight and dominance exerted by a strong male figures. In general, Western society has hatched the idea that Muslim women are stripped of rights most Western women take for granted such as being able to drive or vote, and lack proper representation in Islamic politics or everyday life. In the eyes of Islamic women, this western ideal could not be further from the actual truth. People in western societies are lead to believe by politicians, news media outlets and our government that Muslim women are basically treated as property owned by male figures, and many rebut that erroneous belief is partially founded by the “war on terrorism” and Western women’s “transnational feminism”, while the War on terrorism and Feminism definitely has played a major role in helping portray Islamic women in a terrible light due to the attacks of September the 11th, one cannot simply excuse the derogatory, inhumane, and slave like circumstances many islamic women face in their homelands. The Politics of the Veil, and how it has developed “as a convention for symbolizing women’s modesty or respectability” are valid arguments for the veil, but no one makes mention about the dozens of documented cases in which women and girls were publicly whipped and even jailed in countries like Afghanistan and Saudi Arabia for not being properly covered in public. While the other side makes an excellent point in characterizing the various forms of veiling as symbols of respectability and tradition, in hopes to appease to westerners own beliefs of proper dress signifying respectability and innocence, but again fails to mention how in western countries at least by law are not stoned or publicly whipped for their lack of “modesty”. While i do not think a nation wide ban is the way to go, i think most women will give into social pressure of not appearing veiled in public without the need for there to be a law agaisnt it. The whole burqa/ niqaab debate disturbs me… why is there one? A tiny minority of women wear it in the West (most sisters I know who wear it are Australian born reverts) and the debate magnifies them in an uncomfortable way. In a country where you see a plethora of exotic fashions, no one asks the niqaabi woman how or if she is feeling completely marginalised because her ‘exotic fashion’ is deemed so horribly offensive that politicians are devoting precious resources to debating it. Actually the most part of the Arab women I know just consider the niqab or khimar something “additional”, that is not compulsory according to Islam, and for some of them it is an act of “rebellion” against the Western way of life and fashion, just a way to show that they belong to another country with other traditions, habits, values and clothes. Maybe dealing with this is a problem for us, but not for them, So, why do we have to ban something that is quite normal for them?